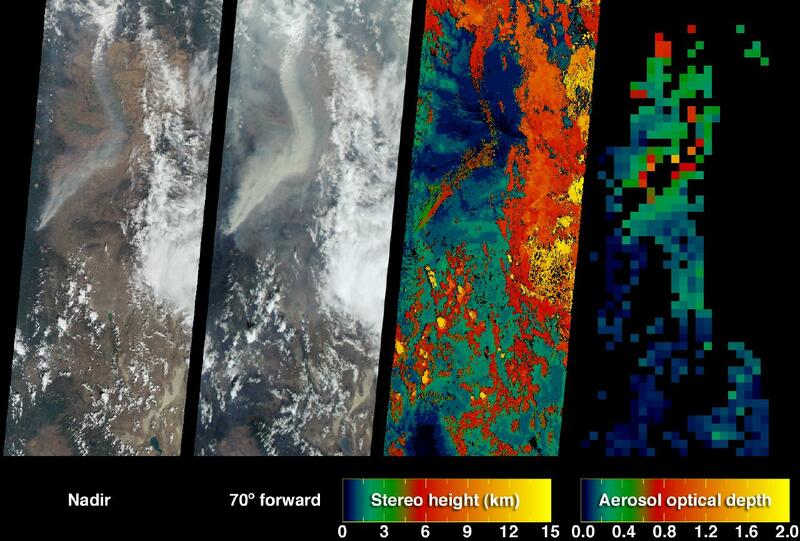 The extent, height, and amount of smoke originating from the B&B Complex Fires in central Oregon are captured in these September 4, 2003 views from the Multi-angle Imaging SpectroRadiometer (MISR). When the data were acquired, the Booth and Bear Butte Fires had been underway for 16 days and had consumed about 70,000 acres near Sisters, Oregon. Although a distinct plume rises from the location of the Bear Butte Fire (just northwest of the larger Booth Fire), the fire-lines had merged together by this time and became known as the B&B Complex. Centered in the Deschutes and Willamette National Forests, the blazes in these mixed-conifer old-growth forests were aided by earlier dry conditions and fed by heavy fuel loads, regeneration timbers, and large tracts of beetle-killed dead woods. The left and center-left panels are natural-color images from MISR's vertical-viewing (nadir) and most obliquely forward-viewing (70-degree) cameras, respectively. The appearance of smoke and haze is enhanced at the more oblique view. The center-right panel is a height field for features exhibiting sufficient spatial contrast for their elevations to be retrieved by MISR's automated stereo algorithm. The results indicate that the tops of the two main plumes originating from the B&B complex differ in altitude by about 1-2 kilometers. 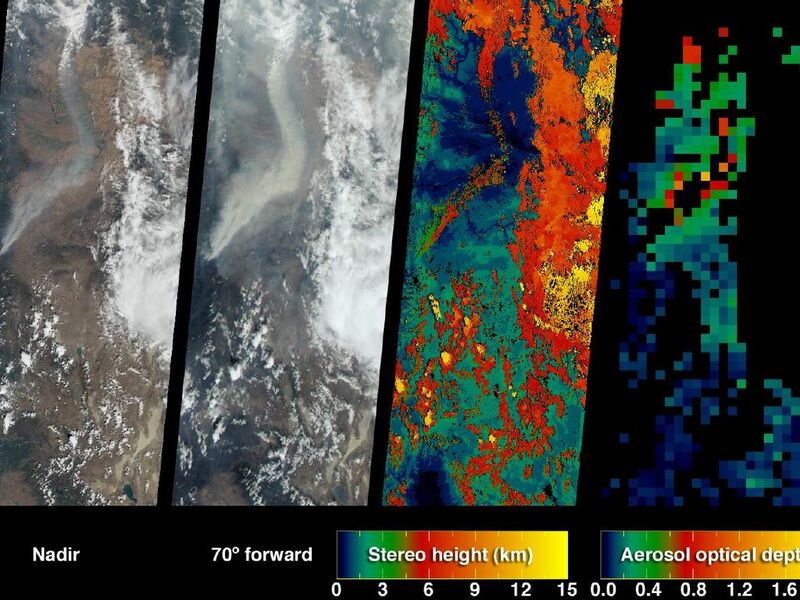 At right is a map of aerosol optical depth, a measure of the amount of aerosol particles present within the atmospheric column. In the central portion of the plume, the smoke was too thick for MISR's automated optical depth retrieval algorithm to work, and over these areas or locations where clouds or other factors precluded a retrieval the map is colored black. 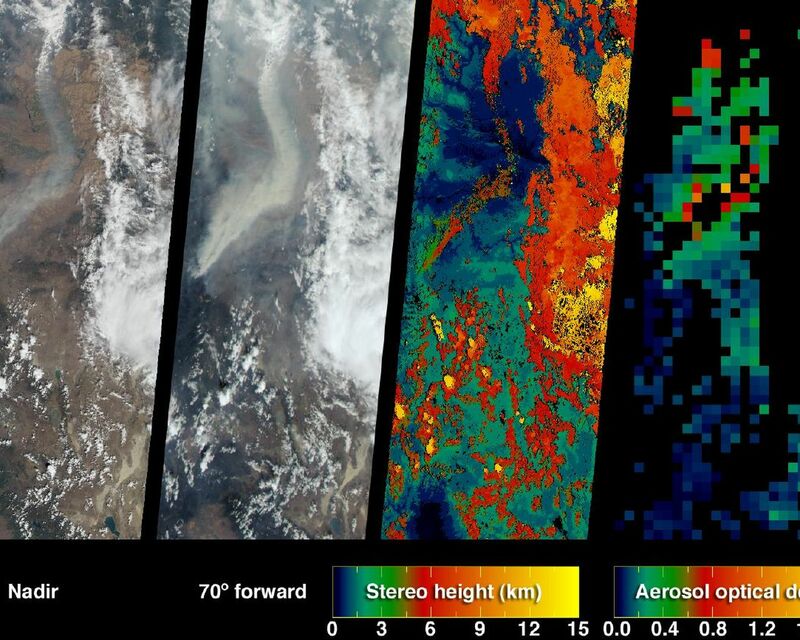 The animation depicts a "multi-angle fly-over" of the plumes, and was generated using red-band data from MISR's vertical and backward-viewing cameras. The imagery at each angle was processed to give an approximate perspective view. The final frame of the animation is at the 70-backward viewing angle, and makes visible the relative heights of several plumes and nearby clouds. The dashed line across this image is a data dropout. The Multi-angle Imaging SpectroRadiometer observes the daylit Earth continuously from pole to pole, and every 9 days views the entire globe between 82 degrees north and 82 degrees south latitude. 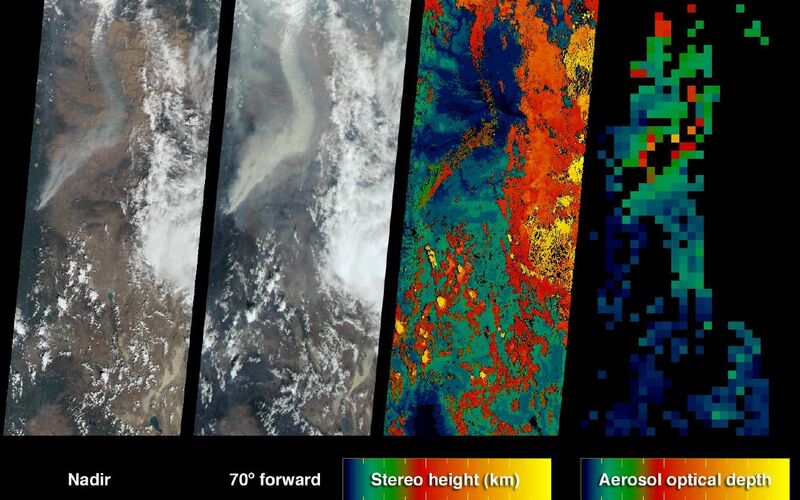 These data products were generated from a portion of the imagery acquired during Terra orbit 19753. The panels cover an area of approximately 400 kilometers x 986 kilometers and extend from northern California to central Washington. They utilize data from blocks 52 to 58 within World Reference System-2 path 44.